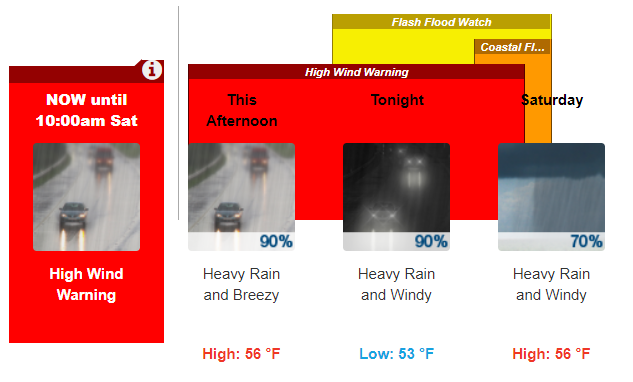 The National Weather Service in San Francisco has issued a Flash Flood Watch and a Wind Advisory for the Bay Area. The Flash Flood Watch and Wind Advisory will be in effect from Friday, February 1 at 3 p.m. through Saturday, February 2 at 10 a.m.
Urban and small stream flooding will become likely along with rapid rises on main stem rivers. Small creeks and streams may rapidly rise near or above bank full. Please act now to protect property by sand bagging flood-prone locations. Sandbags are available at Fire Station 55 (955 Point San Pedro Road) and at the Terra Linda Community Center (670 Del Ganado Road). During the next 48 hours strong winds will be blowing southeast 25 to 35 miles per hour, with gusts from 50-65 miles per hour. Strong winds may blow down limbs, trees, and power lines. Scattered power outages are expected. For downed power lines and power outage reports, call 9-1-1 immediately to report the location of a downed line. After reporting the downed line, call PG&E’s 24-hour Residential Customer Service Center at 1-800-743-5000. Consider downed power lines still active. Stay away from the lines and keep others away from them. Thank you for helping us–we need the extra eyes and ears right now. Power out? Check PG&E’s electric outage map for more information. For flooding and tree emergencies, call (415) 485-3000. For all other emergencies dial 911. –To receive community alerts and advisories from local agencies, sign up for Nixle alerts online (https://local.nixle.com/register/) or text your zip code to 888-777. –To receive emergency notifications, sign up for AlertMarin (https://www.marinsheriff.org/services/emergency-services/alert-marin).